This step needs to be performed only once! 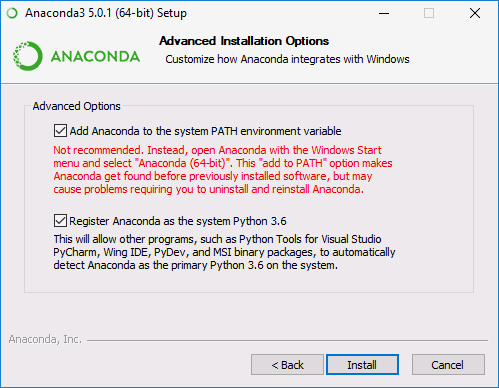 Install Anaconda Python Distribution (please use Python 3.7 version and 64-bit installer). While installing, choose installation for ‘All users’ and select ‘Register Anaconda as default Python version of the system’ and ‘Add to Path’ options (see image below). Do not install Anaconda in the folder with any spaces in the name (e.g. C:\Program Files\)! Download and install latest build of the PLaSK Windows binary. This should be done each time the new version is issued (PLaSK graphical launcher will inform you about it automatically). where your_downloaded_file.deb is the file name of the downloaded package. You need to do the above only once. where your_downloaded_file.rpm is the file name of the downloaded package. If there is no error, you can run PLaSK. You can browse the archive of old PLaSK versions here. PLaSK requires the valid license file to run. or log in into the licence tab and download the file.